Animals, plants, and other organisms that are newly introduced into an area from another part of the world are sometimes referred to as "alien" or "exotic" species. These words are used to distinguish newly arrived species from the native species that have lived in the environment for very long periods of time. Although some people refer to all exotic species as invaders, some scientists believe it makes more sense to use the term "invasive species" only when referring to new species that are spreading rapidly and having a large negative impact on the environment, economic activities, or human health. Many of these invasive species have been introduced into new environments by human activities. Sometimes they are introduced intentionally, such as European starlings, kudzu, and purple loosestrife, three species that spread very rapidly across the United States beyond their initial range of introduction and are believed to have reduced the abundance of native bird and plant species in many areas. However, most species introductions probably occur inadvertently by humans, a byproduct of frequent movements around the globe. For example, small ocean organisms are commonly picked up in the ballast water of ocean ships. When the ships release their ballast water at a port in another part of the world, these organisms are introduced into a new environment. Logs and other wood and fiber products imported into the United States sometimes contain insects from their country of origin, which accounts for the introduction of Chestnut Blight fungus in the United States. 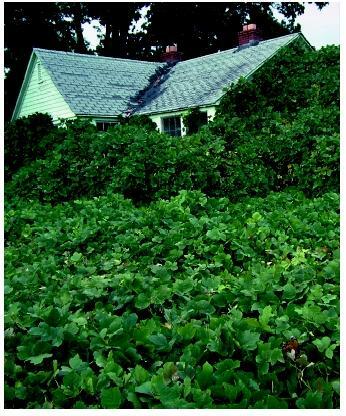 Kudzu overgrowing a house in Tennessee. Kudzu was intentionally introduced in the United States, but it spread very rapidly beyond its initial range of introduction. areas of the United States, and they are so numerous in places that they are clogging up water intake pipes of power plants and municipal water supplies. Leafy spurge, an introduced poisonous plant of grassland, has covered large regions of the northern Great Plains and threatens many of the livestock operations in these areas. One of the most famous ecological disasters associated with invasive species is the brown tree snake that was accidentally introduced on to the Pacific island of Guam. In just a few decades, through its hunting habits, the snake was responsible for the extinction of several of the island's bird species that were found nowhere else on Earth. Problems produced by invasive species are believed to cost billions of dollars every year. Scientists are working very hard to find out what factors facilitate these biological invasions in hopes of providing some help to those trying to control their negative effects. It is clear that trying to prevent the introduction of new species into an area in the first place is the primary step to take. Some scientists are also trying to determine why some environments seem to be invaded more easily than others, or why some environments are invaded only at certain times. Some think that environments that have a high diversity of native species may be more resistant to invasions by new species, while others believe that disturbances and other factors that free up new resources are more important to opening an environment to invaders. There is still much work that needs to be done to increase scientists' understanding of the causes and effects of invasive species. Elton, Charles S. The Ecology of Invasions by Animals and Plants. Chicago: University of Chicago Press, 2000. Pimental, D., L. Lach, R. Zuniga, and D. Morrison. "Environmental and Economic Costs of Nonindigenous Species in the United States." Bioscience 50: 53–65.